Jen Bartels [L], who will play a role in Paramount Network’s forthcoming American Woman, and Kelsey Asbille, who will appear in the channel’s Yellowstone, joined Viacom employees in New York City for the company’s annual Viacommunity Day. 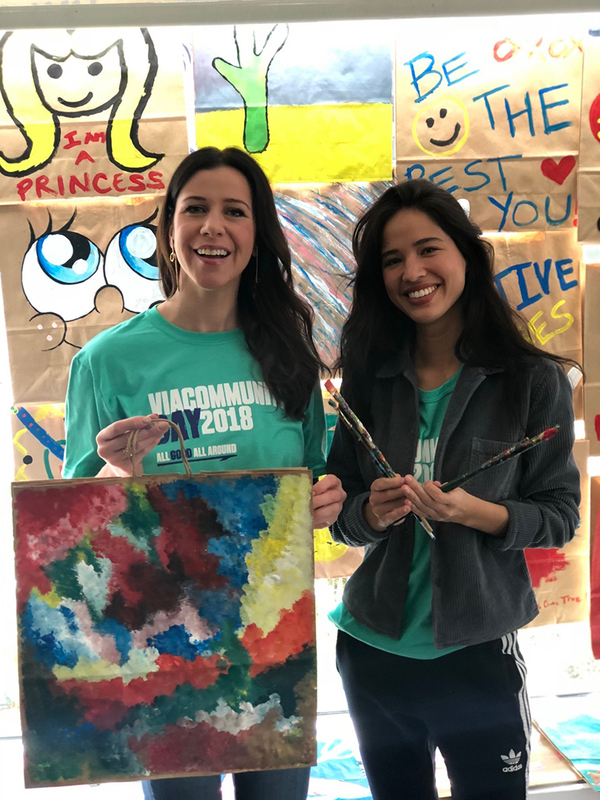 For the past 22 years, Viacom’s annual worldwide Viacommunity Day has given back to those in need. On Friday, April 20, thousands of employees across Viacom and its brands once again volunteered to make a difference in communities around the world, from supporting L.A.’s homeless to organizing gun-safety projects in Florida to restoring outdated facilities in New York City. Joining the Viacom employees for one project at their Times Square headquarters was talent from Paramount Network’s forthcoming originals: Jen Bartels of American Woman (premiering June 7) and Kelsey Asbille of Yellowstone (June 20). The pair sat down with the other volunteers to decorate bags that students at Free Arts NYC can use to carry home the art they create in the program. Free Arts NYC is important in New York City, where one in three public schools lacks an art room. The program partners with schools in these communities to “create access to the arts and exposure to creative careers” for students. They do this by offering free art days for students and families as well as art parties and free museum days. The volunteers decorated bags in a variety of colors, and with inspirational quotes and artistic designs that would appeal to children. Everyone learned new ways to work with a group that is involved in the community. Free Arts NYC and similar groups provide easy outlets for volunteering throughout New York City. Whether volunteers are interested in passing out materials, assisting the youth, or becoming a mentor, the group is always open for those who want to lend a hand. While Viacommunity Day comes around once a year, Viacommunity enables employees to continue to give back to their communities more often, by hosting volunteer opportunities year-round through its All Good All Year initiative. You can follow @Viacommunity on Twitter, Instagram and Facebook to see what our volunteers are up to and to view photos from this past Viacommunity Day.